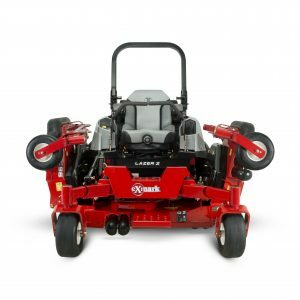 Exmark unveiled its 2018 Lazer Z Diesel commercial zero-turn riding mower. The new model includes a 96-inch UltraCut Flex Wing cutting deck with a rear-discharge design. It features a 48-inch center deck with two 24-inch wing decks and uses four matching blades to deliver consistent cut quality across the entire 8-foot width of cut, according to Exmark. Both wing decks can flex up to 20 degrees up and 15 degrees down to minimize scalping and maximize productivity on uneven terrain, said the company. Raising the wing decks also reduces the required trailering space, allowing model to fit on most trailers designed for 72-inch zero-turn rider mowers, said Exmark. The new model is available with Exmark’s 60- or 72-inch UltraCut cutting decks in side- or rear-discharge configurations, which are welded from high-strength, 7-gauge steel and feature flow-control baffles. A hydraulic deck lift is standard on every Lazer Z Diesel machine. The machine’s Yanmar liquid-cooled diesel engines are powered by Exmark’s RED technology. The RED technology works with electronic governors in the Yanmar engines to increase responsiveness by nearly eliminating the governor lag, allowing the engine to operate at a lower, more fuel-efficient RPM level without compromising productivity or cut quality, according to Exmark. It also tracks machine health, delivering on-screen service alerts and productivity statistics. Exmark offers the 1.6-liter common-rail direct-injection power plant as an option on all three models and a 1.3-liter turbo-diesel engine option on 60- and 72-inch Lazer Z Diesel models. Both engines deliver the reduced exhaust emissions necessary to achieve EPA Tier 4 compliance. The engine and radiator are placed lower in the Lazer Z Diesel chassis, lowering the machine’s center of gravity. The design couples the engine directly to the transmission, completely eliminating drive belts. Isolation mounts under the seat base and footrest and within the motion control system provide three-dimensional isolation from vibration transmitted through the mower frame. The full-suspension operator seat features Exmark’s scissor link ball-bearing suspension system, seat cushion foam and more. An optional Mulch Kit accessory is also available. The Lazer D Model includes a warranty of 5 years or 2,000 hours, with no hour limitations in the first two years.